Wrestling and me. | The Badical One. So this picture might not mean a lot to people, but as silly enough as it sounds its one of my personal greatest achievements I have gotten to complete in my life. So this is a flyer from a wrestling show that took place right here in Orlando at the old Recreation Center next to the old Amway Arena. This was one of the shows I was on, I am almost all the way in the upper left hand corner as Brian Badical. Next to me is a picture of honestly one of my favorite wrestlers growing up, Scott Hall (aka Razor Ramon). The necklace I have there is from a World Wrestling Federation (WWF) show in the mid 90s, I think around 95 or 96. At that show I got to meet Scott Hall who at the time was Razor Ramon, who became largely famous for his amazing ladder match at Wrestle mania 10 with Shawn Micheals. He then went on to be one of the founding members of the New World Order (NWO) in World Championship Wrestling (WCW). During my time at my training school, he along with Larry Zbyszko were two of the main trainers and shared with us their vast knowledge of the industry. This was one of the greatest experiences of my life. I had grown up watching and adoring wrestling, and swore as a kid that I would one day before I died have a professional wrestling match in front of people. Well I ended up having several, and the largest crowd I was in front of was over 300 people. 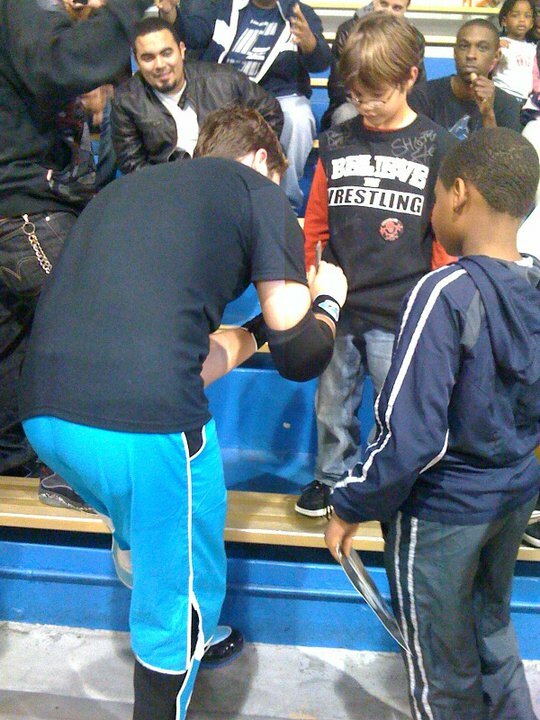 Below is one of the pictures someone took of me while I was giving out some autographs. That was something I never thought I would have ever been asked for, my autograph. Posted by brianbadical on September 28, 2015 in Uncategorized. I think that is an amazing experience! That you got to work for and live your dream! It will be exciting to share with your future students and it is something to be proud of! You only get to those place through hard work and a belief in yourself!